Conditions were good for hill walking with clear visibility, light winds, sunny spells and a comfortable temperature. The first group was dropped off on the A93 and found a fine route up An Socach. They followed the track alongside the Baddoch burn to the end, and then ascended a good path to the wee bealach in the middle of the long whale back ridge to reach the 944 metre summit. From there, they headed north by north east over a high level route, never dropping below 700 metres as they made their way for mile after mile over a fine succession of intermediate tops to eventually reach Morrone, all the while enjoying the tremendous clear views of the Cairngorm Massif from Cairn Toul to Ben Avon ahead. 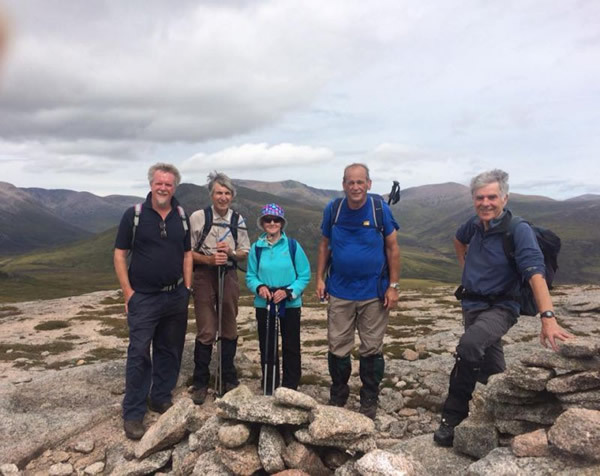 Another group started at Linn of Dee and followed a track to White Bridge before branching off to follow the river Dee past Chest of Dee then a steep climb in deep heather to the summit of Sgor Mor with the reward of great views into the Cairngorms and the Lairig Ghru. They continued along the broad ridge to Sgor Dubh before making their way down to re-join the inward route in the remnant Caledonian pine forest above Linn of Dee. This group had an entertaining session looking at wild mushrooms only some of which were deemed edible. The third group started in Braemar and climbed Morrone from Chapel Brae but rather than return by tracks they extended the walk by taking a bearing from the summit and picked a route to take in many features of interest including a community hydro scheme at Linn of Corriemulzie, and a footpath following the river Dee to Braemar castle. Surprisingly none of the groups met many other walkers but the groups enjoyed sightings of large herds of red deer, red grouse, mountain hares, moorland birds and reptiles with ling heather smelling of honey in full flower. As walkers enjoyed welcome refreshments outside the Invercald Arms, the Braemar pipe band marched past giving a charming end to a glorious day.